Wed., March 2, 2016, 6:18 p.m. While Idaho has been rumbling recently with selective resistance to immigration, the state’s borders have been porous for years to non-native fisheries such as northern pike and lake trout. Smallmouth bass were released in the Panhandle by Idaho Fish and Game in an experiment that gets mixed reviews. A cadre of anglers thrives on pursuing them for sport and competition. But non-native smallies are a threat to Spokane River native redband trout. Northern pike came from the illegal introductions in Montana’s Flathead region. Pike provide exciting fisheries in some waters, but biologists say they pose a threat to certain Columbia River salmon-steelhead areas as they move down through the Pend Oreille River. More recently – as in the past 12 years – walleye have moved down the Clark Fork River, also from illegal introductions in Montana, and are establishing themselves in Lake Pend Oreille. Some anglers think this is the cat’s meow. They’re thrilled to catch these non-native species in the Inland Northwest where God, in His infinite wisdom, chose not to put them. Their passion for these other-world fish is understandable in some ways. Casting a lure to the savage strike of a northern pike cranks up anyone’s enthusiasm, me included. A feast of walleye ranks as one of the most delicious meals we catch from the region’s waters. However, one of the problems with human tinkering in fisheries ecosystems is sustainability. Invasive species have a way of booming and outcompeting native critters in adapted-to certain waters before eventually playing out over years into mediocre fisheries. Montana Fish, Wildlife and Parks officials in the Flathead region point to several formerly manageable mixed species lakes that became flush with little more than hammer-handle northern pike after bucket biologists had their way. Montana is sick of illicit fisheries management, offering a reward of $30,000 for information on the lawbreaker who dumped walleyes into Swan Lake. Idaho Fish and Game this week is making public its stance on the emergence of a Midwestern species that’s settling into the Panhandle region. “Lake Pend Oreille, well known for its kokanee, Kamloops rainbow trout, bull trout and cutthroat is now also the home to a growing walleye population,” says Phil Cooper. The agency’s educational specialist in Coeur d’Alene started with the obvious before inching into the research. 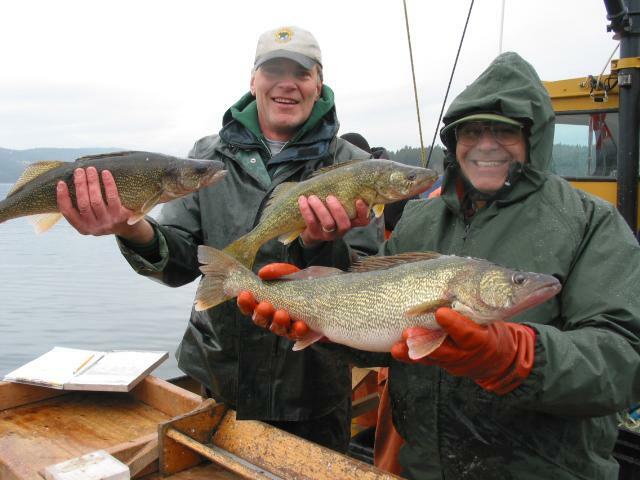 Gillnet surveys in 2011 and 2014 confirmed that walleyes are quickly expanding their presence. Walleye abundance nearly doubled in three years in waters from the Clark Fork delta, across Lake Pend Oreille, and down the Pend Oreille River, Cooper said. “Although targeted by more anglers every year, catches of walleye remain low,” he said. A 2014-15 angler survey of Lake Pend Oreille estimated the walleye harvest at less than 200 fish. Walleye in the Pend Oreille system are growing fast with a healthy component of 5- to 6-pound fish, he said. While their numbers are increasing, they are still relatively low in abundance compared with well-established populations, such as in Washington’s Lake Roosevelt. Indeed, after more than four decades in Lake Roosevelt, the walleye have thinned out their prey base so low it’s affecting their growth, Washington fisheries managers say. “Walleyes present a unique challenge for fishery managers,” Cooper said, noting the species is revered by some anglers for being challenging to catch as well as for the rave reviews they get when walleye is served for dinner. “A walleye fishery has not been available in northern Idaho, and biologists recognize it is something a number of anglers desire,” Cooper acknowledged. Biologists also recognize that new fisheries come with risks. “Walleye are predators that live almost entirely on a diet of other fish,” Cooper said. “In Lake Pend Oreille and the Pend Oreille River, that means walleye may reduce the number of fish of other species that anglers like to catch. They may also pose problems for some of the native fish in the system, such as cutthroat and bull trout. North America has a nearly two centuries of history with introducing exotic fish, including carp, where man thought they would provide fun or food. “Many of Idaho’s most popular fisheries are based largely on non-native fish, but not all introductions were well thought out,” Cooper said, benefiting from 20-20 hindsight. Taking into account the lessons learned, Idaho fisheries managers say they are much more cautious and would employ a rigorous evaluation of potential impacts before stocking non-native fish into new waters. Official policy also prevents Idaho Fish and Game managers from promoting or enhancing fisheries of illegally introduced species. “The policy is intended to discourage anglers from establishing new fisheries through illegal introductions,” Cooper said. Published: March 2, 2016, 6:18 p.m.